a. A grandiose life mission statement, which makes you sound pretty awesome. b. One-year goals, five-years goals and life goals. c. Specific areas of focus in your life (spiritual, physical, familial, etc.). d. A specific trajectory for your life. In other words, a specific description of where you want to be in five years. Most likely, this will include a specific job, a specific level of income, a specific geographic location and perhaps a specific Body Mass Index. And the reality is, even if you don’t have a formal, written life plan, you have a life plan in your head. We all do. You have an imagined future in your head. You want to have a family, have kids, get a college degree, start a business, travel to Europe, etc. You get the point. I don’t have a formally stated life plan, but I want to accomplish certain things. I want to attain a certain level of comfort and stability for me and my family. I want my life to actually mean something. To reference a well-known author who seems to get quoted a lot on this site, I don’t want to waste my life. Now don’t get me wrong: I’m all for planning. Without plans, little of enduring value gets accomplished. Those who fail to plan often find themselves binge watching on Netflix. 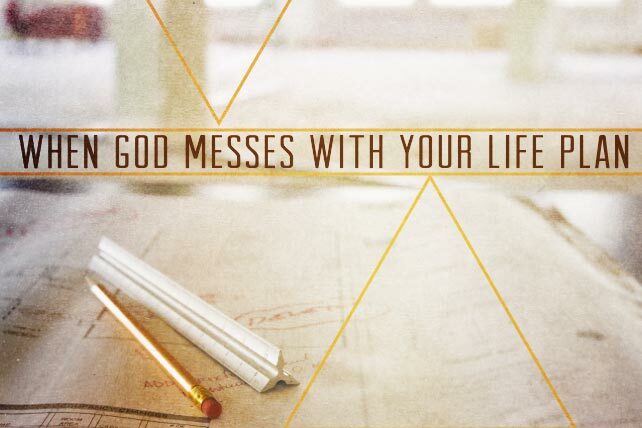 But the reality is, there are many times when God intentionally messes up my life plan. And that’s a really good thing. God really messed up Joseph’s life plan. His brothers threw him into a dry well, then sold him into slavery. The wife of his Egyptian master tried to seduce him. When he refused her advances, she turned him over to the Egyptian cops, who then tossed him in prison. He spent years in prison, waiting to be released. I don’t imagine that Joseph included prison time in his life plan. Finally, after many years of painful waiting, God exalted him to the second in command in all of Egypt. When all was said and done, what did Joseph say to his brothers? God messed up Joseph’s life plan, and it was a really good thing. He did for Joseph what Joseph could never have done for himself.